Braun Thermoscan 7 IRT 6520 is a thermometer for infants, children and adults also, and which has an adjustable fever indicator in accordance with the age. This thermometer has a professional technology which assures a continual precision of the temperature and stores the last 9 temperatures done. It has a Age Precision color-coded display, which allows you to set the age of the person so that the temperature measurement by age is more accurate. The color-coded display changes automatically its color according to the temperature recorded. 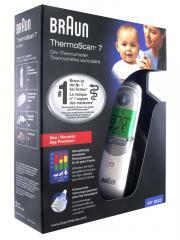 Unlike other ear thermometer, the thermometer Braun Thermoscan 7 IRT 6520 has a nozzle which avoids a preheated cooling temperature. Its positioning system lights for accuracy, and a sonor signal indicates that the device is suitable for taking the optimal temperature. Read carefully the instructions. Always replace disposable lens filters to maintain accuracy and hygiene.